Given I've only been fully invested in the tabletop gaming world within the past 5 years (thanks to my partner, Tobie), I know there are still a lot of different fictional worlds left for me to explore. And I have to admit that despite the many different pen and paper RPGs that I've played now thanks to Tobie, I still haven't played a Dungeons and Dragons game for one reason or another. So oddly enough, Lords of Waterdeep is my first true forray into the world of Dungeons and Dragons, even though it's a board game and not an RPG. And while I don't have a full appreciation of the setting that is Waterdeep and the various lords and factions that call it home, I was really keen on the gameplay, especially after watching the Tabletop episode involving the game. We only recently secured a copy of the game, and it has been quite the treat to play every single time. And I've been looking forward to writing a proper review for the game soon enough. 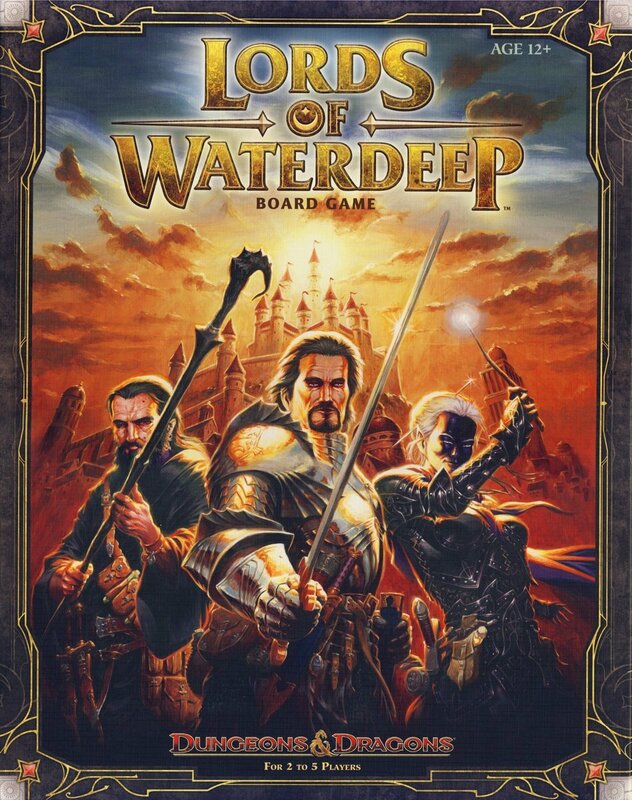 Synopsis: Lords of Waterdeep is a worker placement game designed by Peter Lee and Rodney Thompson and published by Wizards of the Coast, who has controlled the Dungeons and Dragons franchise in recent years. The game uses characters from the Forgotten Realms storyline and is good for 2-5 players. The game puts each player in charge of one of the five factions in Waterdeep - the Knights of the Shield, the City Guard, the Silverstars, the Harpers, or the Red Sashes. There are no game implications for choosing one faction over the other - it's really just to distinguish each player from another given color-coded pieces and tokens. In addition, each player takes a card that represents a Lord of Waterdeep - these are kept in secret and are revealed to other players at the end of the game given bonuses to scoring at that point. There are a total of 8 rounds in the game. During each round, players take turns placing their worker tokens in any of the available spaces on the board that represents Waterdeep. The goal is to accomplish various quests in order to score victory points. And in order to fulfill quests, players will need to recruit various adventurers to their cause - these include Fighters, Rogues, Clerics, and Wizards in sufficient quantities that matched the quest requirements. Like other worker placement games, the challenge lies in there being limited slots where workers can go. If you need to recruit Fighters and another player before you in terms of turn order does that same thing, then you may not get a chance to do so unless you try something else. And you place your workers one at a time - thus it becomes a question of which move is most important - what is your priority and what can you risk someone else taking instead of you? And so even with so limited moves, the game can be pretty compelling. What helps the game feel distinct are Intrigue cards that can only be played when you put a worker at Waterdeep Harbor. Intrigue cards have some pretty diverse effects including recruiting adventurers or forcing other players to give up some of theirs. Or you can allow an already assigned worker to perform a second job in the same turn. But again there are limited slots at Waterdeep Harbor - and every worker placed there means one you couldn't use to draw a new quest or gather more adventurers. The game is brilliantly designed and fairly well-balanced. The random draw of a Lord of Waterdeep that may potentially influence the types of quests you try to take will indeed steer your game play in different ways and helps make each game unique. And even with a mere 8 turns, games with greater numbers of players can last for a fair amount of time and yet will always feel pretty intense. And of course the Forgotten Realms setting adds some nice flavor to the whole experience. Also, the game as one of the best box designs I've seen in a while - even better than Takenoko. They really thought about ease of storing pieces and ease of deploying them again for a new game. The game board fits snugly into the plastic tray in order to better secure all the loose pieces (and those are a lot of wooden workers and different colors of blocks representing the different adventurers), and I really appreciate the fact that they took the time and effort to design the box in this way. Lords of Waterdeep is a great addition to any game collection and nice twist on the worker placement game genre. And yes, you don't need to know anything about Forgotten Realms or Dungeons and Dragons to enjoy the game, as I've clearly demonstrated. The game gets a full 5 annoying mandatory quests that can derail your plans out of a possible 5.